In weeks past we’ve discussed dynamic search and display ads to help you stay up-to-date on the latest digital trends and buzz-words. Today we’ll depart from paid ads and turn our attention to search engine optimization (SEO) and one of its hot-button approaches, blogging. 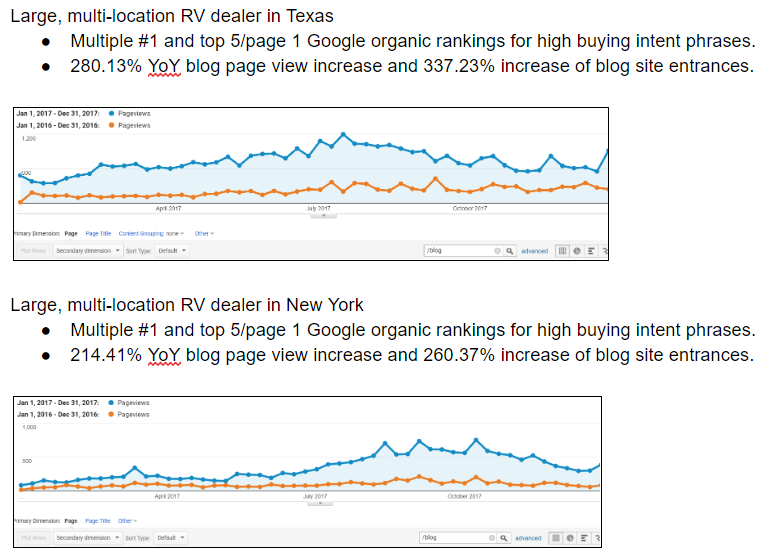 More opportunities to rank and drive traffic. Each new blog post on your site creates a new page for Google to index and rank. And if you’ve done your keyword research, it could mean big traffic increases. More opportunities for hard-to-earn back-links. Link equity (links passing authority from page-to-page) still very much matters, and if all your site has is inventory pages, what content of yours would external sites ever want to link to? Connect with your audience. If you could buy from a dealer whose site has fresh and helpful content (e.g. an active blog) with tips, product reviews, etc. or one whose site appears to not have been updated in the last decade, who would you trust? It’s clear who Google would view more favorably! If you’re not blogging, get on it! InteractRV websites come with WordPress (the best blogging software) ‘baked in’, so it’s easy to get started. And if you need help, we’re here. Further reading here from Moz.